Dr. Charles N. Serhan is the 2018 recipient of the American Society for Investigative Pathology (ASIP) Rous-Whipple Award. Since 1979, this award has been presented annually to a senior scientist with a distinguished career in research who has advanced the understanding of disease and has continued productivity at the time of the award. This award is named after Drs. Francis Peyton Rous and George Hoyt Whipple, both Nobel Laureates and past presidents of the American Society for Experimental Pathology (ASEP), the precursor to ASIP. Dr. Pat D'Amore of the Harvard Medical School describes Dr, Serhan as "…an internationally recognized expert in the molecular and cellular basis of inflammation, [who] has greatly advanced the understanding of disease by elucidating the mechanism of inflammation and its resolution. As a direct result of his work, the resolution of inflammation is now recognized to be an active process, representing a complete paradigm shift within the field…" Dr. Serhan and his team have demonstrated that inflammation is an active rather than a passive process. The evidence for this stems from Dr. Serhan's discovery of endogenous anti-inflammatory, tissue-protective, and pro-resolving chemical mediators that activate anti-microbial defense mechanisms in host mucosal epithelia; specifically the actions of lipoxins, resolvins, protectins, and most recently maresins were found to return the host tissues to homeostasis once they were biosynthesized in the resolution phase. Knowledge of these pro-resolving biochemical circuits and previously unknown novel families of lipid-derived mediators also links the importance of dietary essential omega-3 fatty acids, such as eicosapentaenoic acid and docosahexaenoic acid, in healthy diets and their deficiencies to dysregulated resolution as well as the potential to correct defective resolution mechanisms. Dr. Patricia D'Amore expounds on the significance of this discovery: "This research, as well as all his previous work, promises to provide new avenues to control inflammation and its natural resolution pathways with precision. As Dr. Serhan's work has significance in nearly all biological systems, possible targets for future anti-inflammatory strategies including: (i) therapies against inflammation-induced human diseases such as arthritis and cancer, lung, heart, and periodontal diseases; (ii) enhancement of wound healing and tissue regeneration, and (iii) protective effects for organs and neural tissues." Dr. Serhan is the Simon Gelman Professor of Anaesthesia, Perioperative and Pain Medicine at Harvard Medical School and Professor of Oral Medicine, Infection, and Immunity at Harvard School of Dental Medicine. 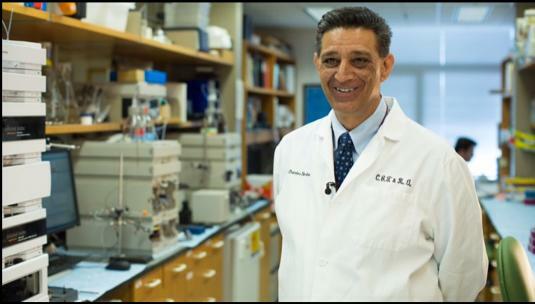 He is the first Endowed Distinguished Scientist at Brigham and Women's Hospital (BWH) and serves as a director at the Center for Experimental Therapeutics and Reperfusion Injury at BWH. Dr. Serhan has been awarded a 10-year MERIT Award from the NIH, and recognized with several other honors and awards, including the Ross Prize in Molecular Medicine (2016), the International Union of Biochemistry and Molecular Biology Medal (2016), and the Society for Leukocyte Biology's Marie T. Bonazinga Award (2010). Dr. Serhan will receive the Rous-Whipple Award at the ASIP 2018 Annual Meeting at Experimental Biology in San Diego, California on Monday, April 23 from 5:15 to 6:30 PM in Session Room 2 of the San Diego Convention Center and will present his lecture, "Decoding Novel Resolution Mediators and Mechanisms in Infectious Inflammation and Tissue Regeneration" on Sunday, April 22, from 4:00 PM to 5:00 PM, in Session Room 3 of the San Diego Convention Center.